Holiday Gift Sets start at $75 – Delivered! Delight the wine lover on your list with the gift of L’Ecole! Choose from one of our exclusive Holiday Gift Sets and a complimentary card with your message and Ground Shipping* are included. For delivery by Christmas order by December 19 (NW) or December 15 (outside NW). 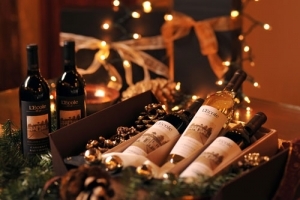 L’Ecole makes it simple and affordable to delight your customers with the elegant gift of wine. Contact jaime@lecole.com or call 509.525.0940 for assistance in selecting the perfect gift. Volume pricing available on multiple featured Holiday Day Gift Sets that meet the minimum purchase requirement. Shipping to multiple recipients? Simply complete this spreadsheet and email it to jaime@lecole.com. *Ground shipping is included on gift sets shipped within the continental U.S. Discounted air service delivery is available to AK/HI, Central, & East Coast regions. Offer valid thru 12/31/17. Exceptionally cold temperatures may necessitate wine be shipped via air service to some regions to assure safe delivery. The 2nd day air rates listed on our shopping cart reflect the promotional discount. For questions, please call the winery at 509.525.0940 Monday – Friday 9:00AM – 5:00PM PDT.